Can you actually build a chicken coop from free chicken coop plans? We decided to check out some free plans to see if they were practical for backyard chicken raising or the small farm flock. August 15 2012: Special time-limited offer. Get my 'How to Raise Meat Chickens Book', plus the 'Movable Coop Plan book' to build the coop above, PLUS all my other practical farming books in the Complete Start Farming Pack and save an additional $20 just until August 31. So we know how to build a chicken coop that suits our particular needs, but we wondered what free chicken coop plans might be available for the novice chicken farmer. In other words, the coop has to keep your chickens warm, dry, safe, and where you want them! So the free chicken coop plans have to at least meet those criteria. There is another point to consider as well: how portable is the coop? At the farm we try not to build structures we can't move if necessary. The coops we use for our meat birds are all easily movable by one person. This is important for raising poultry on pasture; you want to move the birds to fresh ground regularly. Next to consider is the readability and comprehensiveness of the plan itself. Can the plan be easily followed, by a builder with minimal experience in reading plans? So, how do the free chicken coop plans stack up against these criteria? Plan 1: Portable Backyard Chicken Coop Plan from Mother Earth. 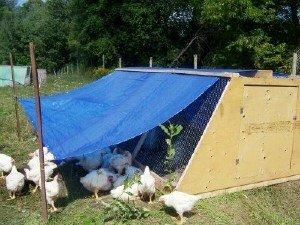 This plan is quite simple, and will produce a small portable coop suitable for a 3 or 4 backyard hens. The plan itself itself is quite clear and the instructions are sufficient to allow fairly quick construction. One possible problem area, the diagrams included are not terribly detailed, and this may prove a challenge for the novice builder. This design has a sheltered coop area about 4' x 4' and an attached chicken yard about 4' x 5'. The structure appears solid and provides protection against the elements and predators. The finished product looks pretty good too. The only point of complexity in the plan is the requirement to 'notch' rafters and floor panels to accommodate structural members. This will require some effort and precision to produce a good finished product, but I could probably build this coop in an afternoon. Regarding portability, this design has an axle and wheels on one end, allowing it to be moved. One minor quibble, the overall length of this coop is about 9 feet, somewhat of an awkward size when buying lumber. I would probably reduce that to 8 feet (make the sheltered coop area a little smaller, but leave the yard the same) or expand the whole thing to 10 feet long and raise another bird or two. The bigger coop will still be easily portable. As free chicken coop plans go, this is a pretty good design, attractive looking and portable. If you have some experience as a builder, this one will be only a minor challenge to construct.